Integrate the fun and creativity of collage making into your website with one easy step. 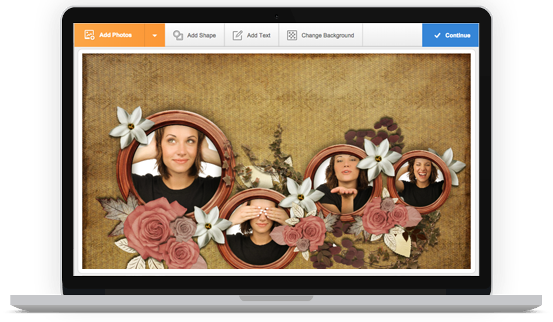 Enhance your online suite with our collage making app for just $99 per month. Our installation wizard makes embedding simple. Just cut and paste the code to get started. Click here to see how others have integrated our collage tool. Provide instant access to hundreds of collage templates, or import custom templates using Photoshop. For the past six years, our collage design app has been used by millions of visitors on the Photovisi website. In that time, we have tested and refined Photovisi to provide our customers with seamless access to their favorite collage-making features. Now, integrating collage design into your own website is as simple as pasting the embed code into your HTML where you want Photovisi White Label to appear. Updates and improvements made to Photovisi and the template library are automatically available on your website, too. With access to hundreds of different designs, your users will always find something that's just right for them. → Start Your Free Trial Right Now! How Are Others Using Our White Label Collage Tool? Totallifechanges.com uses Photovisi White Label to integrate interactive collage making with their life changes business. With our simple embed code, the Photovisi user interface blends seamlessly into the existing website theme, resulting in a fluid process that allow their end-users to express themselves with ease. ― Click here to visit totallifechanges.com and check out the Photovisi White Label tool in action.